The incredible winter bark colour of Acer x conspicuum ‘Phoenix’ – a vivid orangey-pink with silver striations – never fails to attract comment. 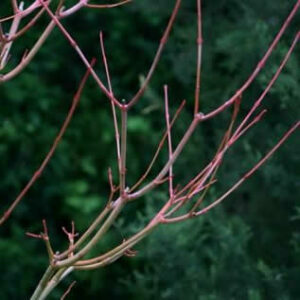 It is this striped winter bark which gives acers like this their common name – snakebark maples. In addition the deep golden leaves of this cultivar provide lovely colour interest in the autumn. To display this plant to the best, make sure it is sited in front of a dark background like an evergreen hedge or shrub. Like many of the smaller maples Acer x conspicuum ‘Phoenix’ does not thrive in wet or enclosed positions and the soil should not dry out completely in the summer, but shouldn’t waterlog in winter. To further minimise the risk of infections and maximise the young wood on the tree prune just before bud burst in late spring.